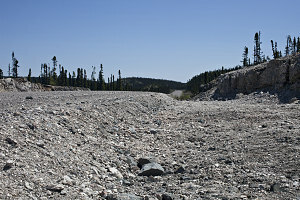 About an hours' drive east from Churchill Falls, we came across a section of fresh roadcut. Normally this would not be all that interesting, but the bright sun highlighted the interesting geology of the bedrock through which the cut was made. 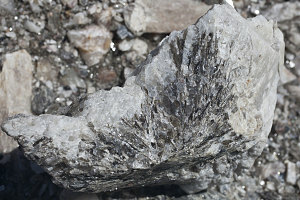 The ground sparkled brilliantly with the reflections off of huge crystals of minerals in the rock. We stopped, got out, and spent quite a bit of time exploring. 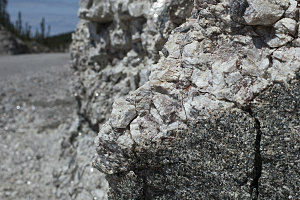 The bedrock that had been crushed and formed into the aggregate on the side of the road was almost too brilliant to look at in the bright sunlight, such was the degree of sparkles and reflection. 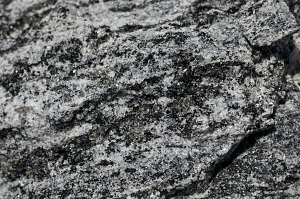 It appeared as if the road had been cut through a section of very coarse igneous rock -- also known as pegmatite. 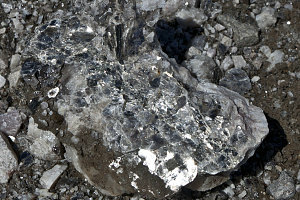 The rock was granitic in nature, meaning that some of the large crystals were of mica - a very shiny and reflective mineral. 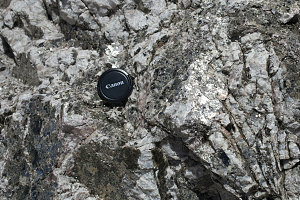 The other usual constituents of granite were also present in large form - quartz and feldspar. 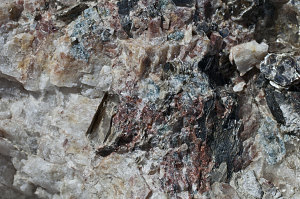 We spent quite a bit of time walking to and fro, looking for particularly huge examples of the various crystals of minerals in the crushed rock, then in the outcroppings of bedrock along the margins of the road cut. Fascinating spot! After satiating the minerologist in us, we climbed back into the car and continued east. 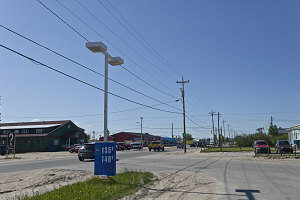 We had another appointment today -- this time in the town of Happy Valley-Goose Bay -- where we were to meet up with John Gaudi of the Canadian Broadcasting Corporation. 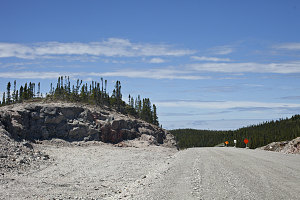 Under continuing sunny skies, we headed east on the now dry and dusty Trans-Labrador Highway. 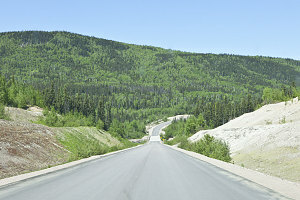 The land transitioned from nearly flat and boggy to more hilly, and the road gently wound through the landscape, with many very pretty views. 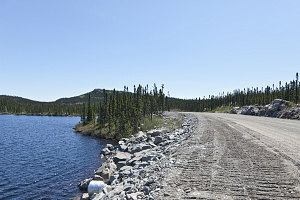 Eventually the road starts a gradual descent into the valley of the Churchill River, where it stayed for the remainder of its journey to Happy Valley-Goose Bay. At this point we were back on pavement - again, earlier than we expected, showing that the highway improvement work was also occurring on this end of the route. 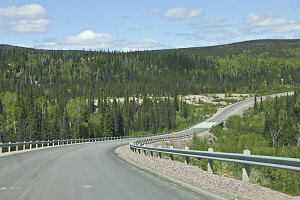 We arrived at the 500/510 junction of the Trans-Labrador Highway system shortly after 3pm. 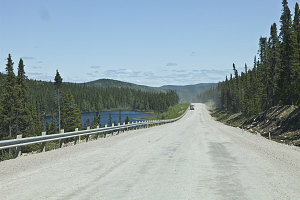 This is the point at which one turns south to link up with the southern Labrador Coast and the connection to Newfoundland, but for now our destination lay a few kilometres further east, in Happy Valley-Goose Bay. 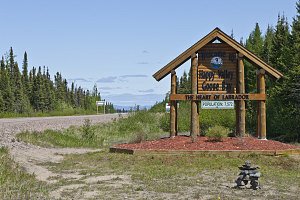 It is the largest municipality in Labrador, and is often referred to as its 'heart'. 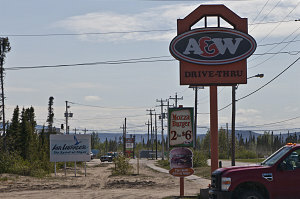 The primary reason why we stopped in Happy Valley-Goose Bay (apart from a necessary refuelling stop) was to briefly visit an acquaintance we had met online. 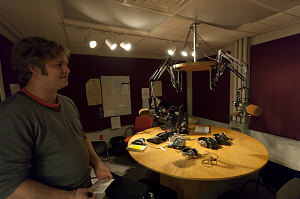 John Gaudi, an investigative journalist with the CBC, had recently asked me some questions about the 2004 expedition to look for Dan and Sue in the Torngats, in preparation for a piece that the CBC was doing on the establishement of the new Torngat Mountains National Park. 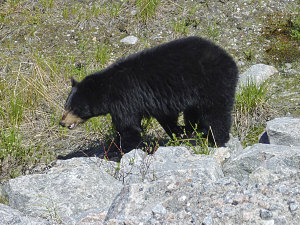 In the process, I had mentioned that I would be coincidentally be passing through Happy Valley-Goose Bay on this trip, and we had set up a quick visit. 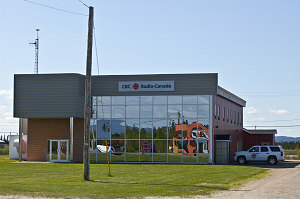 The CBC's facilities in HV-GB are modest but modern. John was very welcoming, and we spent some time chatting about his posting (he was only taking a temporary position in Happy Valley-Goose Bay), about the Torngats, and about outdoors and travelling in general. We still had a fair bit of ground we wanted to cover before stopping for the night, so we bit John farewell and were on our way out of town not long after 4pm.